The daughter of Texas blues legend Johnny Copeland, singer Shemekia Copeland first sang onstage at the young age of ten years old. She is long since removed from her father’s long shadow, forging a distinctive career of her own over the past two decades. Over the course of seven previous albums, Copeland has shown growth as a singer and performer, and has four times been awarded The Blues Foundation’s Blues Music Award for “Contemporary Blues Female Artist of the Year” as well as winning BMA/W.C. Handy Awards for her early albums Wicked and Talking To Strangers. Copeland recorded 2015’s excellent Outskirts of Love in Nashville and evidently enjoyed the experience so much that she returned to record America’s Child with talented guitarist, songwriter, and producer Will Kimbrough (who also played guitar on Outskirts of Love), an acquaintance of mine of which I’ve long been a fan. Kimbrough brought with him to the studio a roster of some of the finest pickers the Music City has to offer, skilled musicians like pedal steel maestros Paul Franklin and Al Perkins, bassist Lex Price, fiddle player Kenny Sears, and legendary Stax Records guitarist Steve Cropper. Nashville A-listers like Emmy Lou Harris, Lisa Oliver Gray, and Gretchen Peters also provide backing vocals on several songs. Featuring songs from skilled songwriters like Kimbrough, Mary Gauthier, John Prine, Kevin Gordon and Gwil Owen, and Copeland’s old friend John Hahn, America’s Child is a stunning collection of Americana-flavored traditional blues music. Written by Hahn and Kimbrough, “Ain’t Got Time For Hate” is a powerful denouncement of fear and racism that features Copeland’s soaring vocals and Kimbrough’s delightfully greasy swamp-blues guitar while “Would You Take My Blood” covers much the same lyrical ground, but from a different perspective, a dark-hued Chicago blues soundtrack backing Copeland’s devastating delivery of the song’s prominent question. Folk-country singer/songwriter Mary Gauthier is as underrated a talent in her chosen musical genre as Copeland is in the blues, and her song “Americans” is in good hands here. Gauthier’s cleverly-phrased and witty lyrics are provided a New Orleans rhythm and jaunty guitar licks over which Copeland drives home the point that, as Americans of all creed and color, we have more in common than we do to divide us. John Prine’s “Great Rain” offers a duet between the young blues singer and the aging folk legend that is as delightful as anything you’re going to hear this year. Oddly enough, Copeland’s sultry vox blend effortlessly with Prine’s gruff drawl as Kimbrough and Perkins’ intertwined guitars provide a solid rhythmic foundation for the song. Copeland knocks the only two real “cover songs” on America’s Child right out of the park. 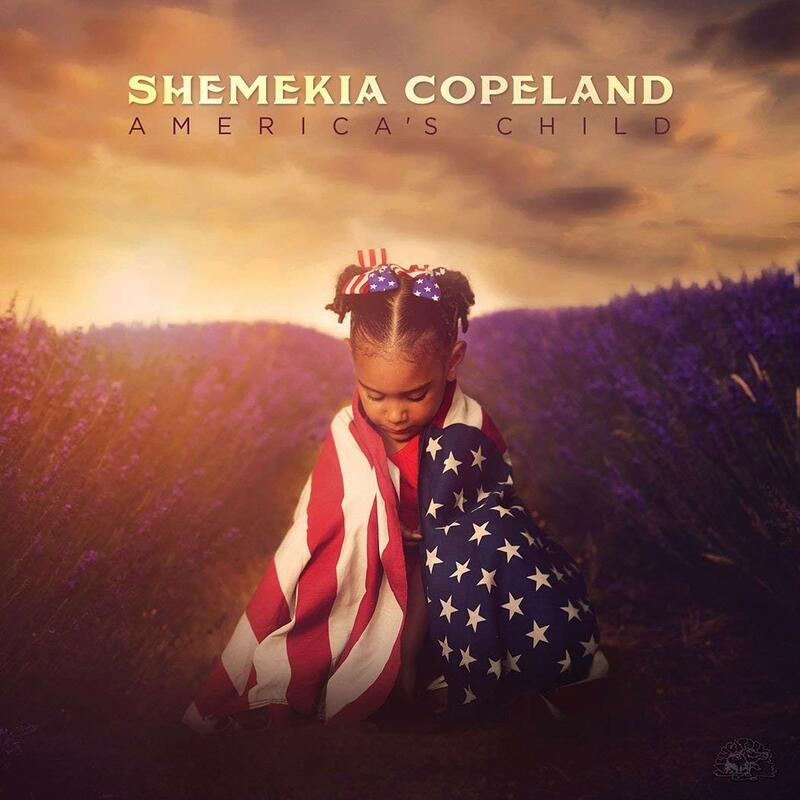 The first, Shemekia’s reading of her father’s “Promised Myself,” featuring Cropper’s shimmering, soulful fretwork and Copeland’s torch-song vocals, the singer evoking memories of Etta James with her heartbreaking outpouring of emotion. The other cover is of Ray Davies’ often-abused Kinks’ klassic [sic] “I’m Not Like Everybody Else,” which was surely one of Will’s song suggestions. Regardless, Copeland grabs the song and shakes the soul out of the thing with an incredible vocal performance that downplays the original’s defiant stance and, in doing so, turns it into a fiery, stronger lyrical statement supported by Kimbrough’s slithery shards of guitar. Guest star Rhiannon Giddens brings her African banjo to play on Gauthier’s wonderful “Smoked Ham and Peaches,” adding an Otis Taylor-styled “trance blues” edge to Copeland’s nuanced singing of the winsome, rustic memories of an era passed by. Copeland is in full-tilt blues-rock mode with the scorching “In the Blood of the Blues,” growling and roaring above Kimbrough’s flamethrower licks as the rhythm section – bassist Lex Price and drummer Pete Abbott – bang out a 1970s-era classic rock sound. Terry Abrahamson’s lyrics are brilliantly provocative with vivid imagery and Copeland wrings every bit of pathos from them. America’s Child closes with the traditional “Go To Sleep Little Baby,” Kimbrough’s resounding guitar the only accompaniment to Copeland’s loving vocals, which are offered with hymn-like reverence.